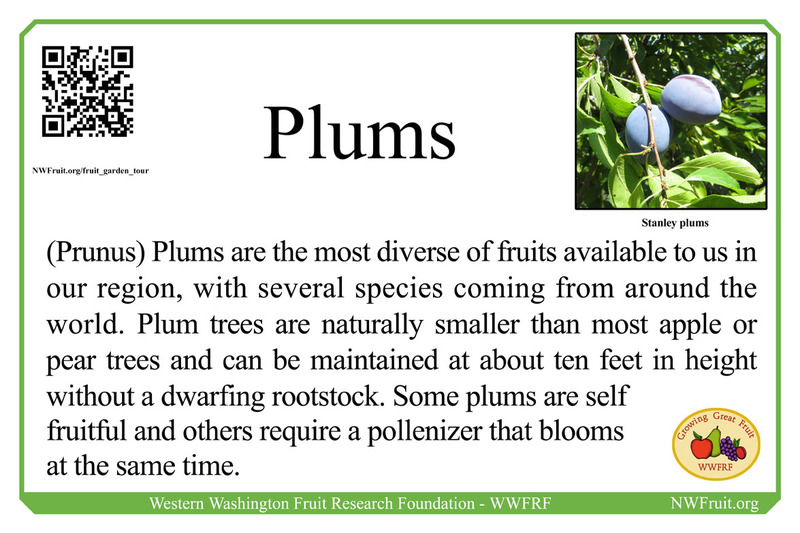 European plums generally have a more upright growth habit than Japanese Plums and take longer to begin bearing. They come in a great array of colors and delicious flavors and are great for fresh eating, drying, preserves and other uses. These include many varieties of Prune Plums, which are purple in color and are prized for drying as well as fresh eating. Other proven European plum types include Mirabelles, Gages and Damsons. The European plums in the Fruit Garden are Imperial Epineuse, Seneca, Geneva Mirabelle, Victoria, Coe’s Golden Drop, Valor, Victory, Gras Ameliorat, Prune de Ente, Ruth Gerstetter, Mount Royal, and Cambridge Gage.